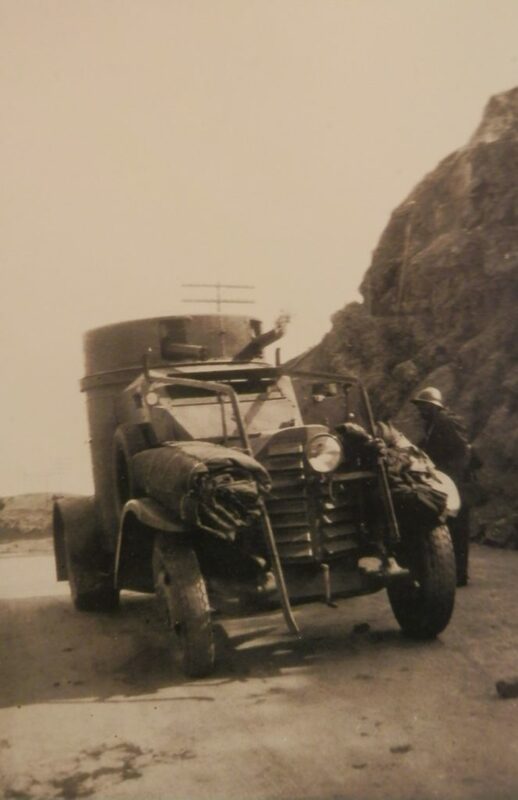 One of Lancia’s early military vehicles was the 1Z Autoblinda. Its history has been somewhat obscure. What was it, when was it made, and what was unique about it? Its seems the Autoblinda 1Z was based on the Lancia 1Z truck, c. 1915. It had a Theta engine and chassis, bodied by Ansaldo in Genova. Its never been clear how many were made, but a visit to Wiki (France) gives a lot of information, with the following information translated largely from their site. It says that the 1Z was used into the late 1930s, and there is a picture on the web of one as 1943. For what its worth, the information looks good, and might even be true. So here we go…..
After the Italian-Turkish war of 1910, during the short period of neutrality before the outbreak of the First World War, in 1914 Regio Esercito commissioned Ansaldo to study an armored vehicle, a major novelty in the the time when the infantrymen were still attacking enemy troops with only one rifle in their hands. The engineer Guido Corni, an expert in mechanics and metallurgy at Ansaldo, presented a project based on the chassis of the Lancia 35 HP (ed. note: the Theta was a 35HP chassis) as the basis for the truck “1Z”. 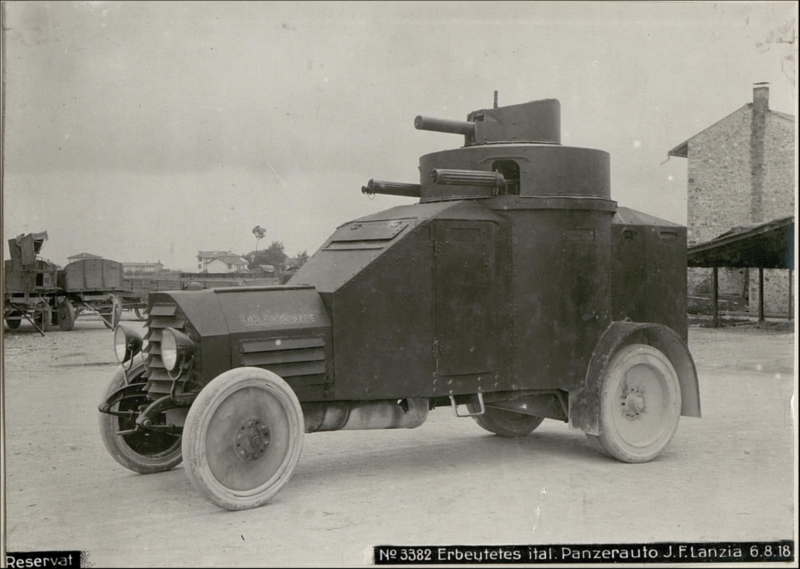 The Ansaldo Lancia 1Z prototype, consisting of two superimposed turrets armed with “Maxim 1906” 6.8 mm machine guns, was presented to the Italian military authorities on April 17, 1915. After conclusive tests on May 7, the Regio Esercito – King’s Army from Italy – placed an order of 20, which differs slightly from the prototype at the bonnet. The originality of this vehicle lay in its two superimposed turrets, which can turn in a single block or separately. The lower turret or dome had two machine guns and the upper one the third. 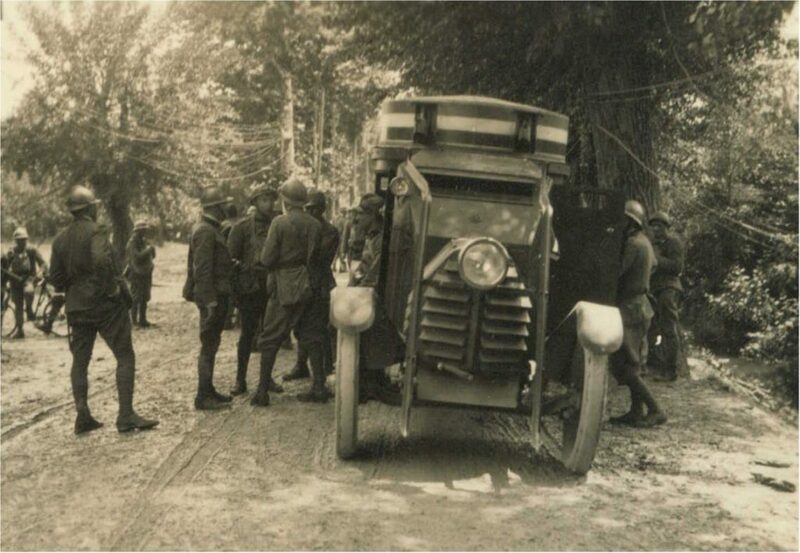 The first Lancia 1Z armored car was delivered to General Cadorna in August 1915 in Udine, the remaining 19 following in the spring of 1916. Three squadrons of these armored carriages were formally established in July 1916. The judgments issued at the time were positive about motorization and protection, but regretted difficulties to back down (reverse?). The vehicle also seemed heavy and cumbersome. This defect was solved later with Fiat 611 model. A second batch of 17 units was ordered in March 1917, differentiated by replacing the front wheel shielding by simple mudguards and the addition of a front radiator protection. This order brought to 37 the number of copies of the first series delivered in 1917. 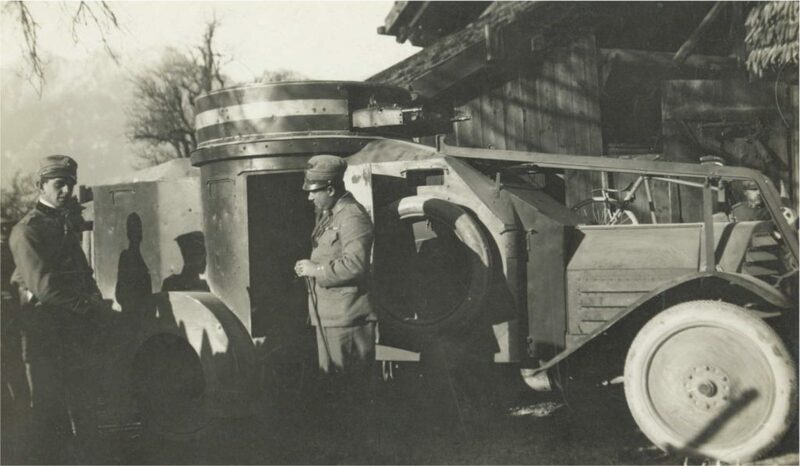 After the initial period of real use on the front, Italy already having entered the war in 1915, the vehicle appeared to be too unbalanced because of its height. It is then decided to have only one turret and to place the 3rd machine gun at the bow of the vehicle. 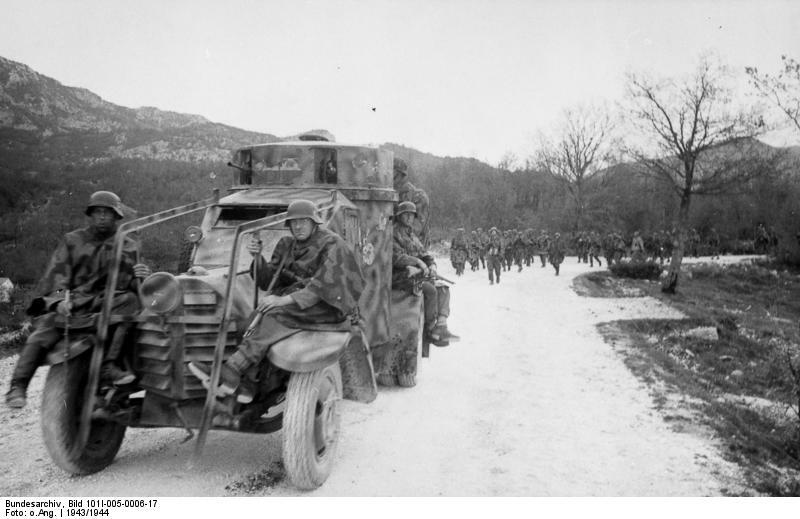 This is how the second series of the Lancia armored car was developed, and some gave it the name of 1ZM. In order to improve its firepower, it was also decided to replace Maxim’s 6.8mm machine guns with St Etienne 907F 8mm machine guns. This choice was particularly unfortunate, the French weapons having a tendency to jam, which could only create problems. Moreover, they could not work when the vehicle was moving, and were quickly replaced by Fiat-Revelli M 1914, much more reliable. 35 “Lancia 1Z” of the third series, were first ordered in November 1917, but then increased to 100 copies in January 1918. This version had only one turret armed with two 8mm machine guns. The third weapon fired through a rectangular opening at the rear. A total of 113 copies of the “Lancia 1ZM” 3rd series model were produced. During the 1920s, the Lancia 1Z machine guns were all replaced by Fiat mod.14 of 6.5mm. In 1935, the replacement of the original wheels with wheels with low pressure tires began for the colonial models. The Fiat-Revelli M 1914 machine guns had water cooling, which was a problem in the hot desert regions. For this reason, all the armored carriages for the Italian colonies of East Africa were equipped with air-cooled 8mm Fiat-Revelli M 1935 machine guns. The copy given to Afghanistan was equipped with air-cooled SIAM 1918 light machine guns. Note: A special version was made to order for the Austrian army with Schwarzelose machine guns, the exact number unknown.